Want to mobilize your friends, family and coworkers to support your passion to save lives and fight cancer? Let us give you the tools and support to build your own web page to share your story, set fundraising goals, and collect online donations for the cause. We will help and guide you every step of the way. EVERY dollar that you raise will go directly to funding cancer research and cancer patient-care programs. Take on the challenge and expect to see unbelievable results! Learn how you can start your own fundraising campaign, everything from a bake sale to a bike ride. 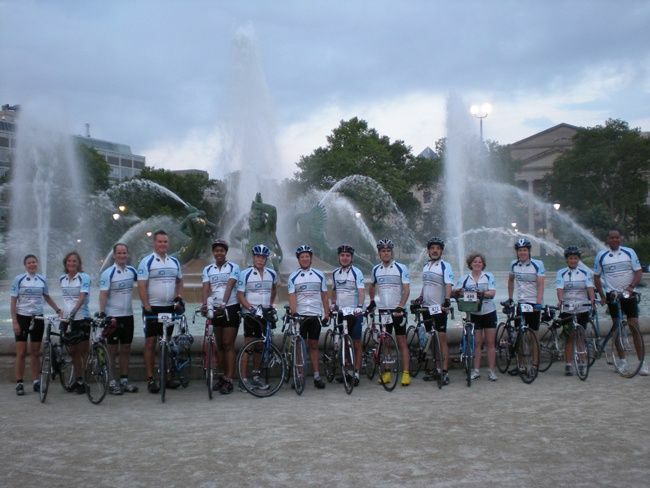 Join the Expect Miracles Racing Team as they conquer events like the Boston Marathon, Gran Fondos bike rides, and Kayak challenges. You can raise funds for Expect Miracles Foundation in any race, of any kind, of any distance, in any city. Just let us know what race you are participating in, and we'll help you with the rest! The Investment Company Institute annually holds the Hoops for Hope Nerf Ball Challenge to benefit Expect Miracles Foundation. This tournament is a fun activity for employees and a great way to pull together to raise funds for a cause. Get creative and do something similar in your office! On average Americans spend about $20 per week on coffee. Challenge your friends and family to donate the money they would spend on 1 week, 1 month or 1 year worth of coffee towards your fundraising efforts. 1 week of coffee would be a $25 donation, with the average Starbucks Latte costing around $3.65. 4 friends could make a $58 donation in just 1 month, just by giving up 1 coffee per week! Every little bit counts. Ask your company if employees can wear jeans to the office on a designated day. In return for the dress down day, employees can make a donation to Expect Miracles Foundation. We continue to be inspired by creative individuals starting their own initiatives to help support Expect Miracles Foundation. There have been wine tastings in Denver, fundraisers at college sports games, a musical theater event and more. Large or small, we are eager to partner with you and help you achieve your goals. Have an idea, or need some advice? Please contact info@expectmiraclesfoundation.org!